Sheffield’s Alyssa Dunham (left) and Allison Schmader defend Smethport’s Erin Herzog during the first half of Thursday’s game. 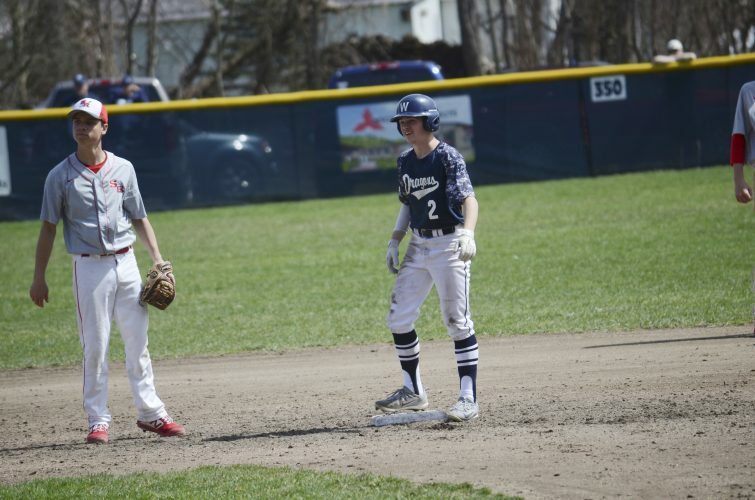 Both Sheffield and Smethport entered Thursday night’s game in search of their third victory. 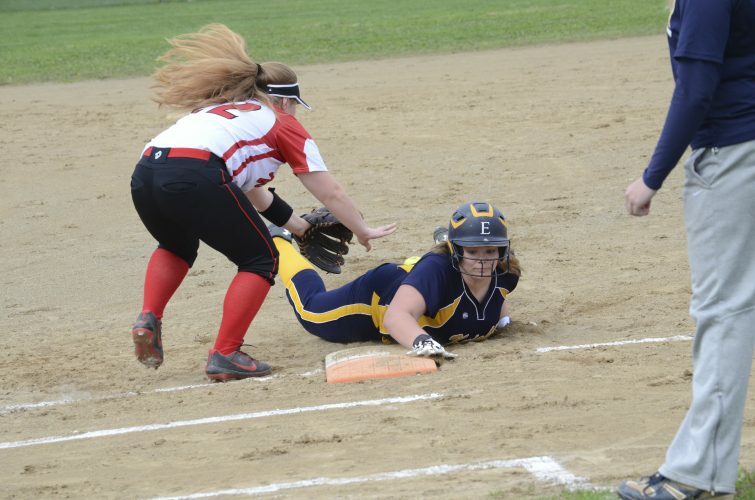 The Lady Hubbers, thanks in large part to the stellar play of Erin Herzog, got it. 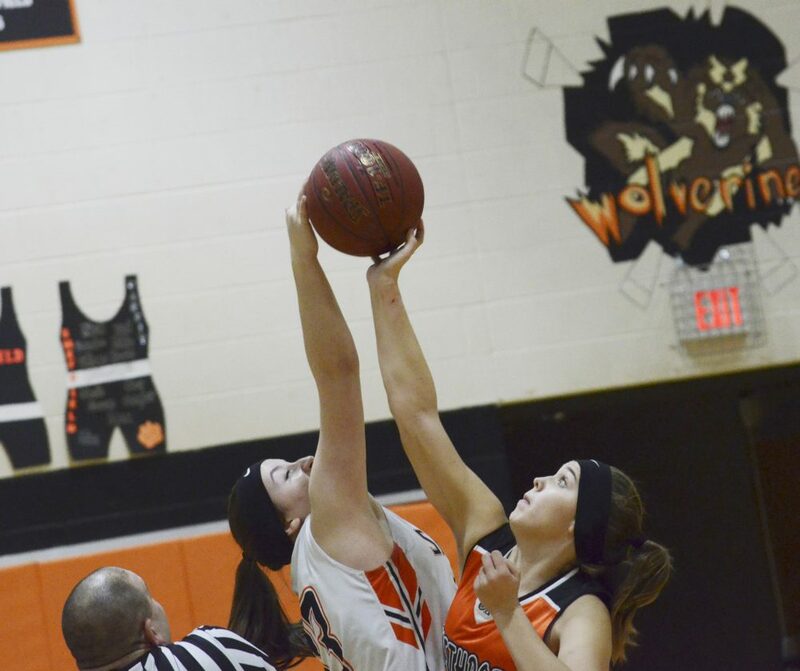 Herzog scored all 14 Smethport points in the first half and had 20 for the game in a 37-26 win for the visitors. “I thought we did a good job defensively, except for Herzog in the first half,” said Sheffield coach Brandon Troutman. Herzog had a pair of buckets on offensive putbacks in the first quarter to stake Smethport to an 8-2 lead. 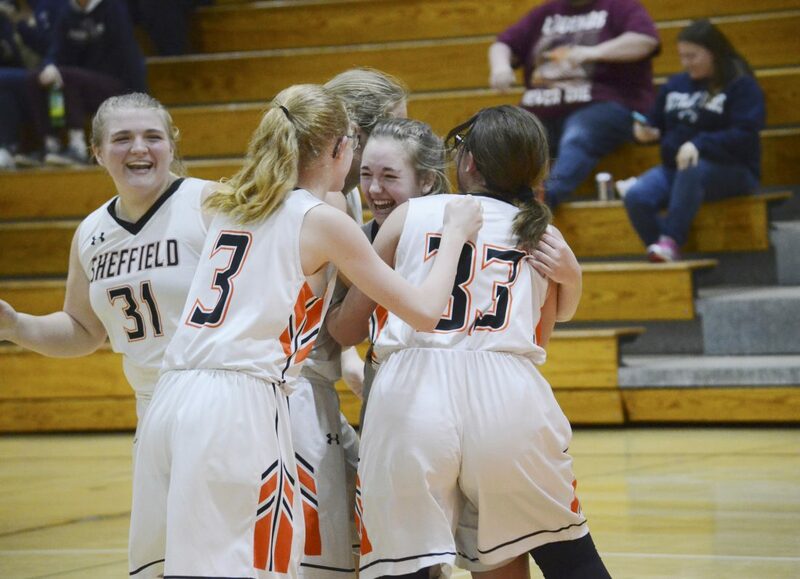 Sheffield’s Allison Schmader (center) is mobbed by her teammates after hitting a buzzer-beater for the win against Smethport in their junior varsity contest on Thursday. Lily Lauffenburger scored Sheffield’s first four points, including a jumper with 4:23 left in the second quarter to cut the deficit to 6. An Emily Leichtenberger layup got Sheffield back to within four, but Herzog scored the final four points of the half on a putback and a jumper to give the Lady Hubs a 14-6 lead at the break. The did indeed, as the second half had a much more energetic feel to it. Leichtenberger came out and scored nine points in the third quarter, and an Allison Schmader 3-pointer at the third quarter buzzer got the Lady Wolverines back within six, 26-20. 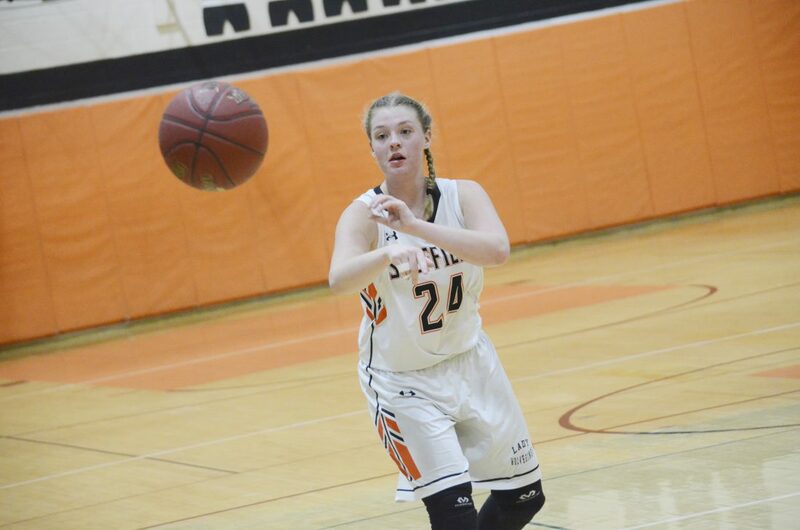 Sheffield’s Alyssa Dunham fires a pass to an open teammate during the first half of Thursday’s game against Smethport. 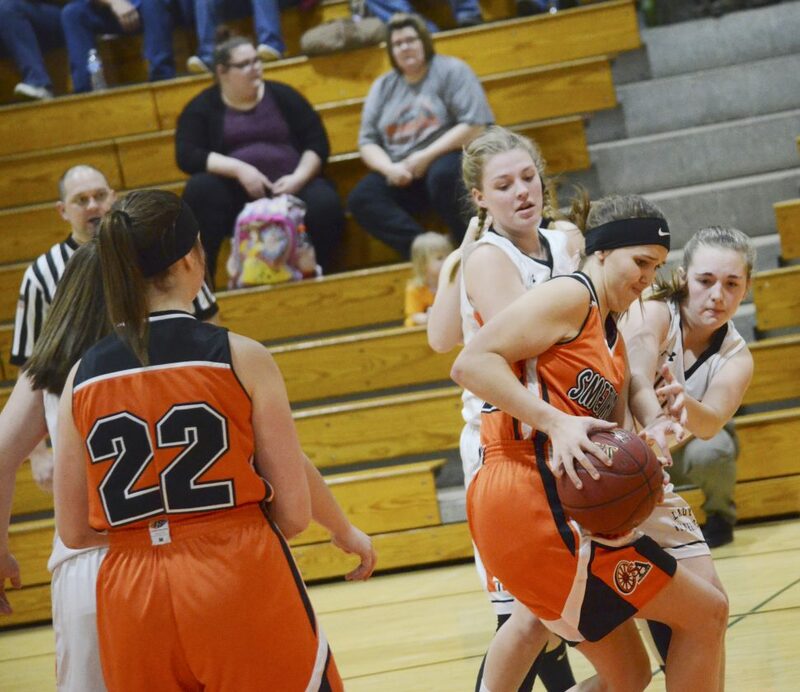 With Sheffield going to a box-and-1 on Herzog, Danielle Nelson and Kassidy Deyarmin picked up the scoring load for Smethport, scoring six points each in the second half. The Lady Hubs rattled off the first seven points of the fourth quarter, and, try as they might, Sheffield wasn’t able to rally. Herzog had 10 rebounds to go along with her 20 points, while Leichtenberger pulled down six boards. 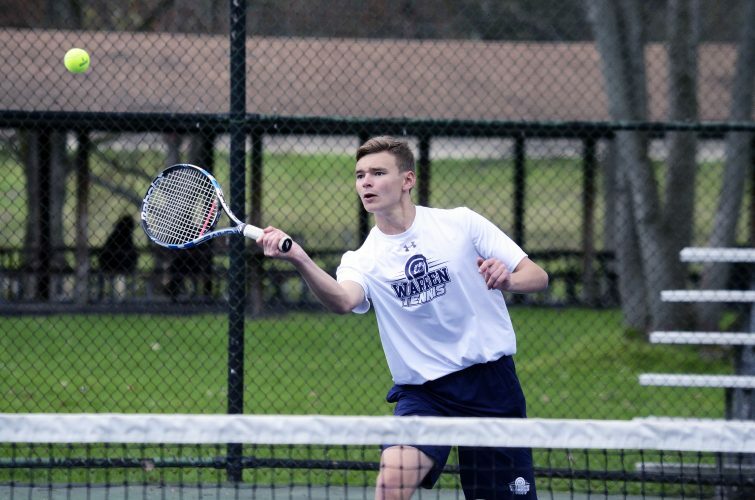 Lauffenburger finished with eight points. The JV game saw an absolutely thrilling ending. Trailing by 1 with just second remaining, Allison Schmader got off a shot at the buzzer and nailed it, giving the Lady Wolverines a 22-21 victory as she was mobbed by her teammates. Sheffield's Emily Leichtenberger and Erin Herzog go up for the opening tip in Thursday's game. 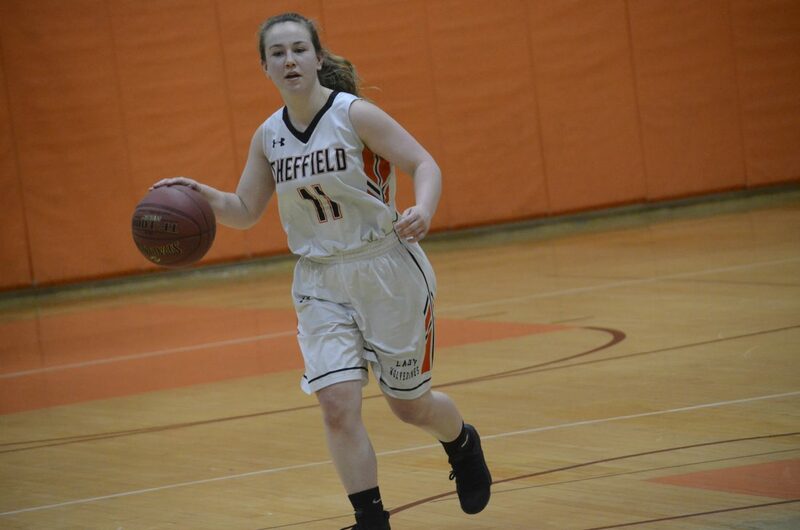 Sheffield's Marissa Grubbs brings the ball up the floor.